Sometimes life is full of surprises. A few of months ago, I found out that I had to attend a business meeting in Singapore that fell during the start of the Easter break. I decided to stay a few more days, take C and the kids along, and make a family trip out of it. I also found out that fellow foodie and good friend L would be in Singapore at the same time, with her family as well. We decided that we would meet up for dinner one evening during our brief stay. Our next problem was deciding where to go. The unanimous first choice was Restaurant Andre. This was greatly dependent on the availability of a table, since there is a more than three-week waiting list. Luckily, I was able to snag a table for our preferred date with no problems at all. The appointed day finally dawned, and I could barely contain my excitement. After making arrangements for our respective kids’ welfare, our group of four headed to Singapore’s Chinatown district, to experience what is touted to be one of the top 100 restaurants in the world. Restaurant Andre is set in a lovely multilevel structure that makes one feel that he is dining in a home. The restaurant is filled with stylish conversation pieces that reflect the chef’s mindset. It felt relaxed and informal, yet a subtle elegance still prevailed. This was quite different from most similar type restaurants that feel uptight in its formality. Although the kitchen is the heart of any restaurant’s operation, I have always felt that the front-of-house also plays a pivotal role. We were very impressed with how restaurant manager Stepan Marhoul oversees his staff. Service was unobtrusive and knowledgeable. Sommelier Ken Hasegawa delighted us with his suggested wine pairings, while the rest of the staff worked tirelessly and efficiently to cater to our every need. I will never forget how Stepan, Ken, and even Chef Andre gamely answered all our questions, and laughed at my (almost always) corny jokes. When our meal was over, they made the extra effort of dropping us outside to our waiting taxicab and wishing us well. Reminiscent of what a polite host would do after a dinner party at his home. Never have I experienced this level of service at all. “An ode to art and a dedication to craftsmanship.” Chef Andre Chiang’s statement encapsulates our four-hour dinner journey into the mind and heart of one of the most creative and hard-working chefs that I have been fortunate to come in contact with. His restaurant does not have an actual menu. It has an Octaphilosophy. This philosophy consists of an eight-part theme that serves as the framework for what Chef Andre conceptualizes for the day, depending on what is available fresh. Most other restaurants have a menu for a set period, whether it be a week, a month etc. Restaurant Andre’s menu could change daily, as they only serve what they can freshly acquire and deem acceptable to Chef Andre’s exacting standards. Of course, all this does not come cheap. Dinner at Restaurant Andre will cost S$288++ (P9800++) per person not including drinks, with an additonal S$188++ if one chooses to have their specially selected biodynamic wines paired with each course. 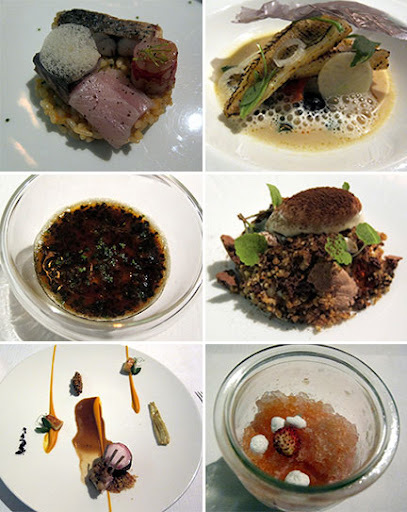 I personally believe though, that dining at Restaurant Andre is still relatively good value, as it is not often that a world-class restaurant still has its head chef directly involved in every detail. Our meal started out with some “Snackings”: Aji (Japanese Mackerel) Tartare, Potato Bravas, Chicken Tikka Masala Fritter, Fish and Chips and Vanilla Popcorn. Standouts were the fritter for its bold flavor and the Potato Bravas. The potatoes were served in a recreation of a potted plant, where everything including the soil was edible (think chocolate). We were then served part one of the Octaphilosophy theme, called Pure. 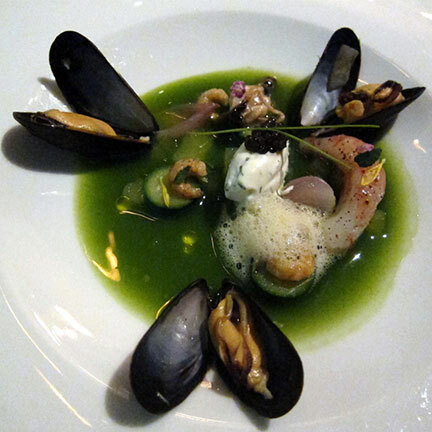 A baby zucchini gazpacho with hand-smoked Normandy Pedigree mussels, Amaebi prawn, and white cheese topped with a dollop of Osetra caviar. As the name implies, no seasonings were used. Chef Andre wanted to bring out each ingredient’s natural “pure” flavor, as well as the confluence of flavors as a whole. This dish was very well done, as it was a clear illustration of the theme as well as the restaurant’s insistence on freshness. Part two was named Salt. A gelato of Atlantic oysters, sea grapes with a green apple foam and green apple bits. This dish showed chef Andre’s playful side, where the apple bits were made to look like rock salt, but actually provided a sweetish contrast to the salty gelato. I felt that I liked this better without the apple foam, which I felt masked the briny, “redolent of the sea” flavors that I have always enjoyed. Duck Tongue, baby heritage aubergines, fried salsify root, cream Anglaise and black sesame pepper. This was the seeming mish-mash of ingredients that inexplicably attained harmony. Artisan is what this is called. South is a tribute to the South of France. A setting that holds so much fondness in Chef Andrei’s heart. Sunny and kaleidoscopic is how I would describe this, my favorite part of the meal. It comes in two parts: First, a tomato and persimmon salad topped with raw flounder slices and Hijiki stalks. A chilled, delicate sea urchin risotto with sea bass, mackerel, amber jack and Spanish prawn followed. I distinctly recall taking very small bites, almost daintily as it were, since I wanted to preserve the whole experience as long as I could. Texture is what fellow dining companion EK called a mind f%*#. Japanese squid puree and Arborio rice served with opposing profiles. Where the squid is made to feel like rice in the mouth, presented like a risotto, and the rice was presented as a black rice cracker. Although this interplay was quite creative, and thoroughly engaging, it was probably my least favorite course flavor-wise. Our next course, Unique, was seared Kisu fish (Japanese Whiting) with Barigoule stewed artichokes topped with a sweet potato glass. Aptly named, since the Kisu fish is only available during the spring months. The Kisu was ethereal, and extremely fresh. It went very well with the smoky artichokes that had a hint of bacon. The only constant on the Octaphilosophy menu is called Memory. Chef Andre considers this his signature dish, a foie gras gelee in a warm black truffle emulsion. Brace yourself, take a taste and revel in the exquisiteness as your senses are treated to a gustatory piece of heaven. There was an aura of speechlessness around the table, followed by a few groans of delight that were peppered with muted curses. Terroir, the last of the eight courses, was a different take on the traditional Agneu de Lait. Instead of using the traditional young or suckling lamb, Chef Andre used a young rabbit instead. There was some initial hesitation at the sight of the very tiny loin and rack. However, all was forgotten as I took the first bite. It was tender, with just a slight gaminess that I enjoyed. It came with a butternut squash puree, dehydrated black cauliflower, braised Dijon mustard seeds and potato gnocchi. We were all quite full after eight courses. I am afraid we did not do justice to the beautiful cheese plate that followed. After giving it a cursory taste, we moved on to the dessert courses. We started out with a wild strawberry granita with marshmallows and yogurt. Tart and refreshing, this acted like a palate cleanser in preparation for our next dessert, Snickers 2012. Apparently, Chef Andre comes out with an annual version. The 2012 edition is a study in deconstruction. With peanut and chocolate crumble, nougat crème and a scoop of Snickers ice cream, being the main components that still achieve a semblance of harmony. We ended our four- hour experience with a smooth Chateau de Maniban XO Bas Armagnac for the men and glasses of Domaine des Chenes Rivesaltes Ambre 2004 for the ladies. It is always a treat to be overseas, enjoying a great dinner, peppered with lots of laughter, amongst the company of loved ones and friends. It somehow allows you to completely relax and just be in the moment. Happy times. *An edited version of this post appears in the December 2012 issue of Town and Country Magazine Philippines. how indulgent! Hope to visit Singapore soon! Why only biodynamic wines? 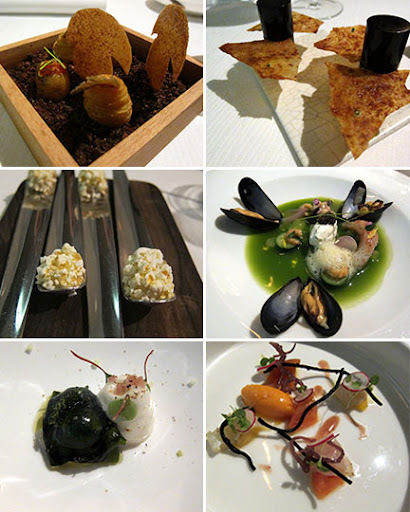 Hi Lanie, The restaurant espouses the highest level of ecological practice both with food and wine. Hence the use of biodynamic wines. Thanks for stopping by. Teddy, Thank you for your kind words. It is comments like yours that keep me striving! Happy holidays to you and the rest of the family.